Every awning tells a story, how can you enhance the message in yours? Every awning tells a story and sends a very specific message. Whether you are making sure that your business is easy to identify or using an awning to promote a product, promotion, or event – there are some good design essentials to consider in order to make them look their best. 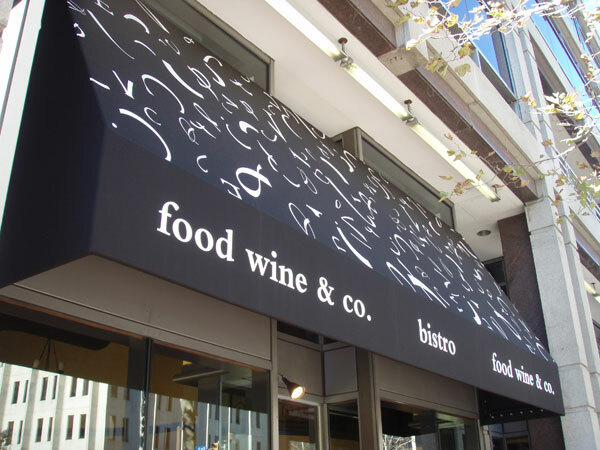 These commercial awning tips will help solidify your business’s brand identity and increase eye-catching visual impact. In conversation, it’s not just what you say. How you look, how you sound, and how sincere what you’re saying seems all play a role in how your words are understood. With signs and commercial awnings, it is the same. While something written in sloppy handwriting can display the same combination of words as a beautifully well-lit awning, it will not convey the same message about the business it represents. Mediocre awnings will help people find you, but they won’t attract new customers by making a solid first impression and showcasing your business. Make sure your commercial awning looks coordinated with all of your other signs and marketing materials. Make them easy to read by using fewer than seven words, and leaving plenty of room to ensure your lettering is large and evenly spaced. Use a single graphic or color scheme. When passing advertisements people tend to tune out anything that is overly busy or complex, which is the opposite of what you want for your business. Opt for a bold font rather than using all caps, which people often find obnoxious. While it is unlikely that your business will be open around the clock 7 days a week, you certainly want your awning to be visible at all times. Even if you’re not open on a Sunday, people will still drive and/or walk by. If your business is in an unusual spot and people find it hard to find and often pass right by, lighting your awning may be the solution. Lighting allows you to take advantage of opportunities that cannot be lost. Make sure that lighting is permitted and that you sue proper high-quality outdoor lights. The Carroll Awning Company provides the best quality, energy-efficient canopies, awnings, and frames for any business, restaurant, home, or apartment. We design, create, and install custom-created canopies and awnings all year round! For a free estimate, call 1-800-999-5617 or click here to contact us online.